We run a variety of photography courses for anyone keen to get more out of their camera while taking advantage of this beautiful part of the country. We have a passion for making sure that you leave our photography courses with new skills and more confidence to take photos that you are proud of. 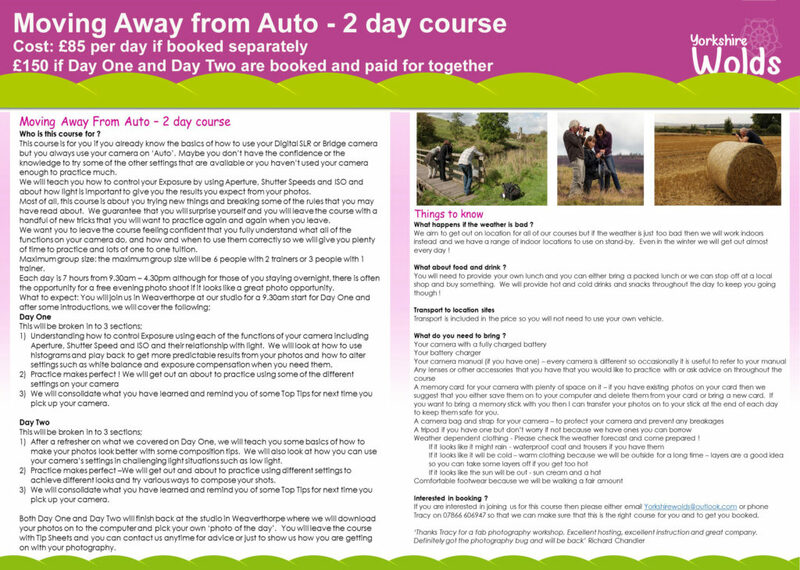 We want you to have a fantastic experience here in the Yorkshire Wolds whether you join us on one of our half day photography courses or one of our 2 day programmes. We are very happy to organise course dates based on your availability so all you need to do is let us know what dates suit you. Your day will begin in our studio to familiarise yourself with some of the more important controls on your camera and get some top tips before we head out to one or more of the many locations in the local area to get hands-on. At the end of every day, we return to the studio to download your photos and consolidate what you have learned for next time you pick up your camera. You will leave every course with tip sheets and you can contact us anytime for advice or just to show us how you are getting on with your photography once you have been on any of our courses. 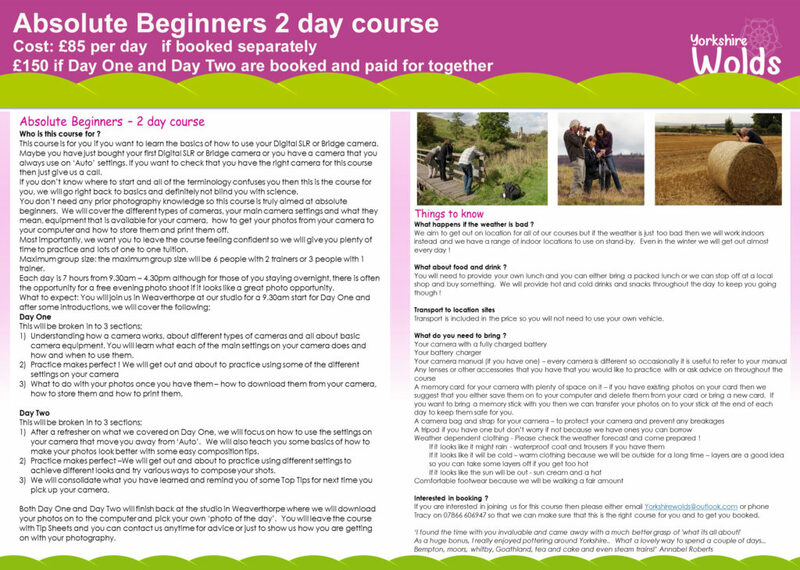 We specialise in running courses for absolute beginners and guarantee that our group sizes are realistic and customised according to the type of course that we are running so for example, our absolute beginners course will never have more than 3 people per tutor to make sure that you have as much one to one tuition as you need. In each course, we will cover all of the things that you need to become a better photographer whatever your level. We will look at composition, exposure and how to move away from ‘Auto’ mode to get the most from your camera, all of this we will do it at your pace and using simple, uncomplicated language. See below for more information about our courses but if you prefer to have One to One tuition, we would be happy to arrange something bespoke just for you. If you are interested in joining us on any of the courses, please use the form on the 'Contact Us' tab or phone us to book so that we can make sure that you are on the right course for your needs.